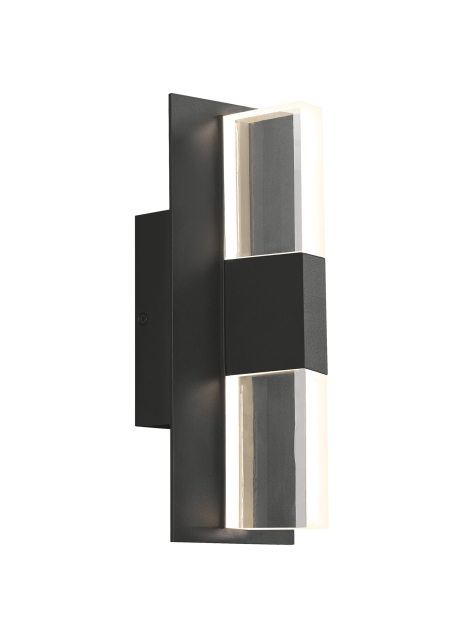 Combining modern geometric design with unique diffuser materials, the Lyft wall sconce by Tech Lighting can create either of two distinctive lighting experiences. solid, sand-blasted acrylic diffusers that create a wide dispersion of soft LED up and down light. or clear acrylic diffusers that add sparkle to the illuminated area with equally effective light distribution. The contemporary Lyft sconce design is available in two sizes (12 or 18 inches tall). This unique outdoor light fixture features a durable, marine grade powder coat finish available in three finishes. Charcoal, Black or Bronze. Lyft wall scones feature stainless steel hardware and impact-resistant, UV stabilized acrylic lensing for added durability and stability. Two diffuser options. clear acrylic to create a dramatic sparkle or solid white to create a wide dispersion of soft light.